Choosing a hosting provider for your WordPress website is an important decision. In this article we will discuss some of the excellent features offered by WP Engine’s managed hosting service and why we recommend them to every client. Managed WordPress hosts specialize in hosting WordPress websites specifically and they offer special features like caching, staging for updates, easy backups and restores, and speed enhancements. They are generally helpful with WordPress issues, and they often have additional security features that other hosts don’t have. This is very different than traditional shared hosting where you simply rent storage on a server which may or may not be well designed to work with specific platforms or technology, and where you may feel left on your own if your site is hacked or you have a WordPress specific question. When you start a new blog/website it’s normal not to think about things like server performance, traffic and security and often people looking for hosting only consider cost. You want to worry about the site’s appearance and what content to publish rather than the technical underpinnings of the server hosting your site, and that’s totally understandable. Often it is only after the site’s been up for sometime that issues with your server will begin to arise, and you may start to wonder about your choice of web hosing. Maybe your site slows down or you have down time, or goodness forbid your site gets hacked. Good quality managed WordPress hosting guards against these issues, and even though it tends to be a bit more expensive, it can save you a lot of hassle, and even money, in the long run. 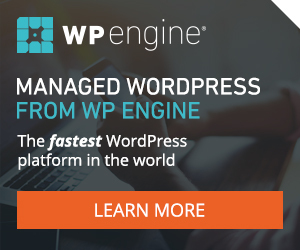 Why is WP Engine the Best WordPress Hosting? WP Engine’s WordPress hosting is designed and optimized for WordPress websites specifically. They take care of every single piece of server optimization to ensure your website is living on the most fastest and best WordPress hosting platform possible. WP Engine’s technical team and customer support consist of WordPress developers and trained experts. The WP Engine support team is available 24/7 via phone, chat or support tickets. We can not emphasize enough how valuable it is to have a smart and knowledgable support team available for you (and your website) at any time. They are also extremely professional and friendly! WP Engine takes security very seriously. They monitor server traffic 24/7 and are able to prevent malicious traffic and attacks. In addition to real time monitoring and finely tuned server security, all WP Engine plans include daily backups and 1-click restore points. With WP Engine you are only 1-click away from your site being restored to a prior state if anything goes wrong. The WP Engine architecture and caching system ensures your site will perform at optimal speed and their architecture is continuously improved to reduce site load time. Additionally WP Engine can make use of a Content Delivery Network (CDN) to distribute your site data across a global network of servers to reduce geographic distance between your site visitors and your website data if you server a global audience. We can not emphasize enough what a valuable tool the one-click staging feature is. We LOVE it! A staging website is basically a copy or clone of your live website. One of the reasons we love the staging environment is that it gives our clients are safe and easy place to try out core and plugin updates or plugin additions before changing things on their live websites. This way, clients can take control of their own updates while maintaining confidence that those updates will not break any functionality on their live website. To top it all off, WP Engine now offers free SSL certificates through Let’s Encrypt. With fast and easy configuration we appreciate how painless it is to configure SSL for any site on WP Engine. Your website is very much like a living thing. It needs care and love and maintenance. You probably spent many thousands of dollars investing in your new website, and you want your users to enjoy a fast and reliable experience when they visit it, while you want to maintain it in as pain-free a way as possible. This is where WP Engine comes in. In closing, it may seem like spending $35/month on hosting is a lot, and with plans starting at $35/month WP Engine is not a “cheap” hosting solution. But with all of the great features, performance and support that WP Engine can offer, we believe that it is an excellent value. Gravity Forms is one of the best form plugins for WordPress powered websites. It allows you to quickly and easily create a form by dragging and dropping form elements into the editor, change their names, properties and settings. One of many elements available to use is the drop down field. You can either add the values manually using the form editor or populate all items dynamically via filters in your code. For this example we will be covering dynamic drop down population via filters. We’ll end up with a drop down field populated with a list of movies, which is set up as a custom post type in our WordPress installation. In order to keep it organized, and since we’re going to dynamically populate the items, we can delete all the default items (First Choice, Second Choice, Third Choice) that Gravity Forms adds when you add the field to the form. If you check the official Gravity Forms documentation, you will see that it suggests you to write down the Field Id (in this example, id = 5) so you can use it in your code to target the correct element to be populated. Even though this will work, I would prefer to add a class to the element and check for this class when targeting the element in the code. This way there’s no need to worry about ids, which sometimes can be a problem if you work with different environments or servers where the ids can be different on each installation. For this field, we’re going to use the class name ‘movies-dropdown’, set under Appearance > Custom CSS Class on our drop down. With our drop down set up in the form editor, it’s time to created the logic behind it. The filter we’ll be using is the ‘gform_pre_render’ filter, which is executed before the form is displayed and can be used to manipulate the Form Object prior to rendering the form. //Note: when changing drop down values, we also need to use the gform_pre_validation so that the new values are available when validating the field. //Note: when changing drop down values, we also need to use the gform_admin_pre_render so that the right values are displayed when editing the entry. Gravity Forms is an great plugin and it allows you to build pretty much any custom functionality using its Hooks and Filters, and there are many others you can use. For more information and details about all of the Gravity Forms features, you can always refer to their official API Functions documentation. Hope this helps and see you next time!